We are all enjoying the sights and sounds of Titan sent to Earth by Cassini from the Huygens lander. What few realize is how close we came to getting nothing but garbage from it. The Italian company that made the radio link between the two crafts failed to take Doppler shift into account. To make matters worse, the timing information was in firmware, not software, so it couldn't be fixed en route. The whole flight had to be altered so that Doppler shift could be avoided. If it weren't for the persistence of one scientist, we would be bemoaning a very expensive failure today. Thanks Slashdot. Radio telescopes in the U.S. have confirmed that the Huygens probe is functional, that it entered the atmosphere of Titan, and that is appears to have landed. It won't be too long before we receive the data from its sister ship, Cassini. NASA has a Cassini-Huygens page that contains the latest information. I'm really looking forward to finding out what the probe has taught us about one of the most interesting and mysterious places in our solar system. For those of you wondering what a "Titan" is, it's a moon of Saturn that is actually bigger than the planets Mercury and Pluto. Update! NASA is expecting the first pictures in about a half hour (1:45 P.M. U.S. Central time). Update #2! 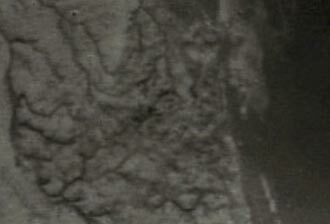 The first picture has been released, showing what appears to be a shoreline on Titan from the height of 16 kilometers. Update #3! Even more pictures on NASA's Cassini-Huygens page.